Before the 1800s the town was little more than a truck stop for travelers and traders moving up and down the country in search of better things. The earliest recording of the town's name is 'Mydilsburgh' which alluded to the town's middle-journey status on the famous Christian Durham to Whitby route. In 1801, there were no more than four farmhouses marking the territory of the town. In the early 1800s, one very forward sighted entrepreneur, Joseph Pease, decided to nurture Middlesbrough's much overlooked potential. 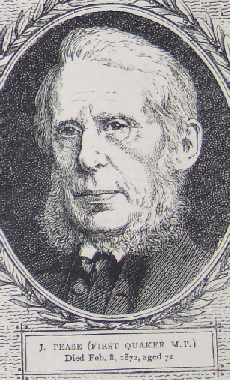 Pease used his influence to establish a rail connection from Darlington and develop Middlesbrough as a port for coal. He famously predicted that "Yarm was, Stockton is, Middlesbrough will be". Indeed, the motto chosen by the first body of town councillors was 'Erimus'; Latin for 'We will be'. Joseph Pease (22 June 1799 - 8 February 1872) was involved in the early railway system in England and was the first Quaker elected to Parliament. Pease joined his father Edward and other members of the Pease family in starting the Stockton and Darlington Railway Company. Pease was married to Emma Gurney, daughter of Joseph Gurney of Norwich in 1826. They had sixteen children, amongst them was Arthur Pease (1837-1898). Pease's ninth child, Elizabeth Lucy married the agricultural engineer and inventor, John Fowler. Fowler was a pioneer in the application of steam power to agriculture. In 1829 Pease was managing the Stockton and Darlington Railway in place of his father. In 1830 he bought so many of the collieries in his area that he became the largest owner of collieries in South Durham. That same year Pease, Joseph Gurney, and some other Quaker businessmen bought a large tract of land at Middlesbrough. They turned it into a port for exporting coal. In December 1830 a new railway line was opened on the Stockton and Darlington to Middlesbrough to get Pease's coal there. In 1832 Pease was elected as a Member of Parliament for South Durham. As a Quaker, he was not immediately allowed to take his seat, because he would not take the oath of office. A special committee considered the question and decided that Pease could affirm, rather than swear, and he was accepted into the membership of the Parliament. He was also unusual in that, like most Quakers of the day, he refused to remove his hat as he entered the House of Commons. Pease supported the Whig governments of Earl Grey and Lord Melbourne. He joined Thomas Fowell Buxton in the anti-slavery movement. He supported the removal of bishops from the House of Lords. He was also in favour of shorter Parliaments and the secret ballot. He retired from politics in 1841. In 1860 Pease became the president of the Peace Society, a post he held until his death.